Amazon – the word conjures deep, dark mysterious land inhabited by strange and exotic beasts. In a way, Amazon has justified our vision of it, where else but here can we find the Capybara, howler monkeys, Piranha’s etc. 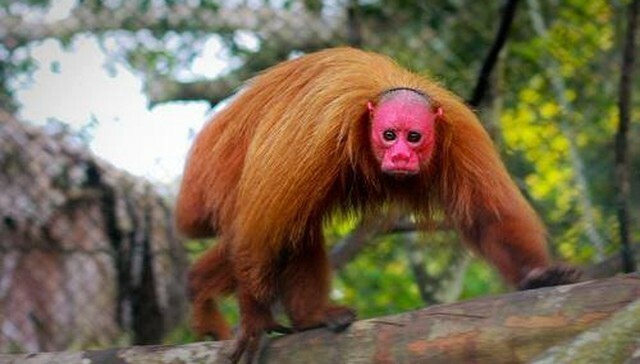 Enhancing this rich collection of the fauna is the Bald Uakari. The Uakaris are small primates found in South America. They are completely bald headed and possess a vibrant red face. 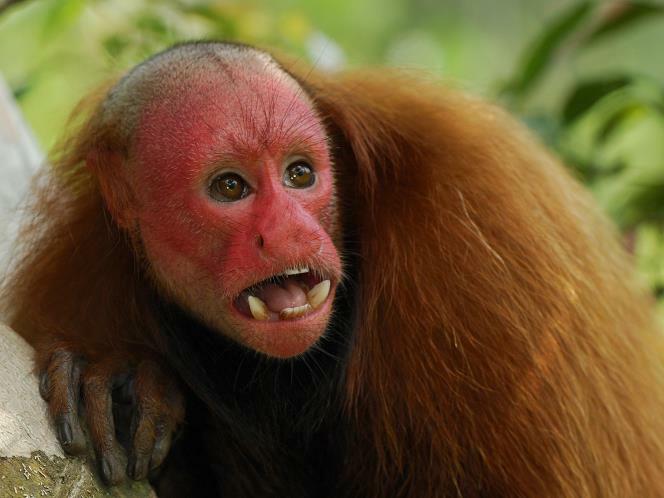 The rich, deep red color is due to a network of capillaries running just beneath the skin of the primates. 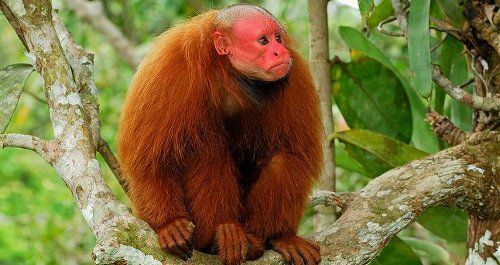 The vivid redness of the face indicated the health of the Monkey; the redder the better. The crimson color is a big turn on to the mates because a sick monkey develops a pale face. The short-tailed, shaggy-coated animals are arboreal and can live up to 20 years. The Uakaris have a shaggy coat ranging from brown to orange. Though extremely short-tailed, they traverse the branches nimbly using their arms and legs. These tree-dwelling creatures prefer to stay nearby water sources such as river or ponds. But in the dry season, the primates descend from their lofty heights to search for seeds on the ground. These New World monkeys are social and live in groups called troops. Uakaris live in large groups. Some troops may include up to 100 individuals, however, they split into smaller groups of one to ten individuals to forage for food. They sleep up in the rainforest canopy at night. Uakaris are predominantly vegetarians, although they may snack on small insects now and then. Uakaris scavenges during the day. Their diet mainly consists of fruits, but they also eat leaves and occasional insects. They have powerful jaws that can crack open the hardy Brazil nut. The monkey rarely comes down, preferring to forage in the trees. Rapid deforestation and slow rate of reproduction are threatening the existence of these primates. The bright looking creatures are not looking at a bright future, unregulated mining and widespread timber operations are cutting into the heart of this primates territory. These intelligent animals are captured and sold as pets in the local market or for consumption. The females reproduce once every two years. They give birth to a single infant. The reproductive age for females is at 3 years and for males at six years. This has not helped in the expansion of Uakari population. The International Union for Conservation of Nature has classified the Uakaris as “vulnerable” on its Red list of Threatened Species. Google Street View Throws Up Shocking & Bizarre Pictures of Humans Without Head Or Limbs, Animals With Two Legs!